Leo and Cancer are two worlds apart. With their striking differences, they have distinctive approach towards life both personally and professionally. Leo finds moodiness if Cancer very disconcerting while Cancer cannot stand proud nature of Leo. But with a generous dose of tolerance and understanding, this relationship can work very well. Typical Cancer are very gentle people with lots of emotions and sophisticated mannerism. They are the people who work hard with determination to achieve success which is more a synonym of money for them. Though Cancer are a bit flirtatious in nature but once they are in serious relationship, they prove to be very caring and loyal partners. While Cancer are usually calm people with soft eyes and friendly smile, they cannot handle rejection and criticism and hence are also never rude or arrogant themselves too. Cancer find stability to be most integral part of their lives and extravagances is a crime in their eyes. But the Cancer can be very generous if any of their family members needs financial help. They are also known for their possessiveness and can suffer from unknown insecurities and fears at times. The Leo are proud and quite passionate people about everything. They need to be in the spotlight and have control over everything around them because this is the route to their generosity, loyalty and compassion. This stems from the courage and sensuality that makes up the Leo, hence the need for compliments is always there. Most Leo are hard working as they aspire for a king-size lifestyle. It might be difficult to picture Leo as outstanding achievers, when caught lazing in their leisure hours. But when they take up some work, they execute it with a fervor that can often make the onlookers awestruck. Their loyalty and grace are more predominant if they are admired and if not then one have to face their arrogance and anger. Both Cancer and Leo can make a great duo in all relations, who lend their support to each other during the thick and thin. The Leo can provide the Cancer with the much needed emotional security and the Cancer can fulfill the desires of Leo. Due to Cancer’s wonderful sense of humor, the Leo feel a deep connection with them, and the Leo can even wholeheartedly forgive Cancer for their frequent mood swings. Both of them share the love of photography which helps in developing a creative compatibility between them. With the aid of the Cancer’s accurate instincts, the Leo are able to transform their dreams into reality. Despite of many turbulent phases in their relationship, Leo and Cancer turn out to be wonderful partners in all walks of life. The Leo should give the Cancer the opportunity to take charge finances and emotions to keep peace. The Cancer might think that the Leo is not careful with money whereas the Leo thinks that they have got an economical approach towards financial matters. The Leo can be heartbroken if they cannot get the things which according to them are a necessity, which is sometimes offered in excess by the Cancer and sometimes avoided as they feel that the needs are actually luxuries. 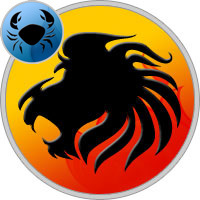 There are some Leo who are good at spending money, and they share a great rapport with Cancer. Despite possessing a sensitive nature, the Cancer can ruin the Leo’s confidence, over a period of time. When the Leo stops being tolerant about the Cancer’s constant mood swings then they can help the Cancer to lead a better life by changing some of their inane habits. The Cancer should try to show the Leo the right path but at no point should the Cancer try to dampen the Leo’s spirits. Leo and Cancer make great relations with each other though they are just opposite to each other. In fact their difference add the beauty to their relation and makes it complete. Being siblings, friends or colleagues they share a warm and helpful relationship with of course an upper hand of the Leo especially at the places where spotlight is concerned. As relatives they only get in good connection if the Cancer knows to flatter the Leo, else they may just be easy going and less considering. They can also have a good business venture, especially if the finances are taken care by Cancer and dealings are done by Leo. A love relation of Cancer and Leo goes great in all the ways except for the insecurities of Cancer and need to get plenty of devotion, by Leo. Both Leo and Cancer together make very reliable parents with Cancer with an upper hand and both also make obedient and loving children with lots of talents to make their parents proud of them. Both the Leo and Cancer should realize that certain things should be done in limit or else it can hurt the other person. The Leo should give up their arrogance and extravagance together with their unnecessary desire of spotlight while Cancer should try to be more stable emotionally and more expressive. Also Cancer have to give up their past and live for their present and future. The day they start implementing this idea into their lives then they start experiencing less number of problems in their relationships. Patience does not come easily to the Leo and the Cancer are never prepared to learn certain words of wisdom from the experienced Leo, due to their proud nature. But deep down the Cancer are aware that they need to learn some lessons on life with the aid of the Leo. They should try to learn from each other, so that their relationship can prosper. The marital relationship between a Leo male and Cancer female evolves beautifully with harmony and peace. This is truly the most romantic relationships out of all the associations. What makes their bonding so strong is their ability to appreciate and admire each other’s qualities and talents. They are able to strike a perfect balance in their relationship which is great combination of her femininity and his strength. When they deeply fall in love, their bond is blessed by the almighty. Their love keeps getting stronger with their passion and emotional dependence on each other. Their acceptance of their individual personality helps them unite as a strong couple who is there for each other till their last breath.